Unit 1 Carbon Court Springvale Road Park Springs Barnsley S72 7FF United Kingdom 012268 27999. Air Intake & Fuel Deliverys. 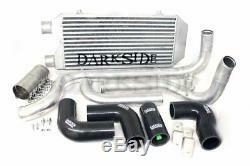 Darkside Front Mount Intercooler Kit (FMIC) for 1.9 TDi PD130 ASZ. Fits Mk4 Golf / Bora with the 1.9 TDi ASZ PD130 Engine. The Kit replaces the stock plastic pipe work and unnecessary joints that can cause boost leaks. The end tanks of the Intercooler are also Alloy so will also hold a higher level of boost, the thicker core offers vastly improved cooling capacity. The Welded Alloy Pipes are 51mm and fit perfectly in place of the stock turbo pipes. Core Size - 500mm x 235mm x 60mm. Darkside Developments Alloy Front Mount Intercooler Darkside Developments Alloy Pipe Kit with MAP Sensor Boss Darkside Developments Silicone Hoses Darkside Developments Turbo Clip Adapter (Optional) Stainless Steel Clamps. The EGR Delete to be used with this kit is listed here. We also have a Side Mount Intercooler Kit, that is listed here. This kit will not fit the PD130 ASZ Seat Ibiza / VW Polo and Skoda Fabia, the kit for these vehicles can be found here. This Kit will fit Vehicles with the following Engine Codes. VW Golf MK4 - ASZ 130. VW Bora / Jetta - ASZ 130. THIS PIPE KIT WILL NOT FIT VEHICLES WITH XENON HEADLIGHTS AND HEADLIGHT WASHER SYSTEM. All the silicones included in the kit may require slight trimming to suit your set up, these are left long to take in to consideration tolerances between cars. We now offer a range of Silicone Colours - Black, Blue and Red Silicone's are in stock where as the other colours are special order and may take up to 1 week to dispatch. Sometimes the turbo clip can be quite tight to push in due the tolerances we have them machined to. We have found that warming the turbo compressor housing with a heat gun helps the clip push in. We do not offer credit terms under any circumstances. All goods remain the property of Darkside Developments until paid for in full. Unwanted items must be unused and in the condition they were sent. This is to prevent customers from ordering parts'just in case' they need them. This does not affect your statutory rights. We aim to credit your account within 10 days of the product return. Where a part is missing we will contact you and advise of the charge for any missing element. We will then credit your account minus the charge. Stocked items are usually dispatched on the same day if the order is made before 2pm. Due to stock levels and work load we cannot guarantee dispatch times. E 24 Hour Service is from the point the items are collected not from the point of ordering. It is the buyers responsibility to pay these charges upon import and to adequately research such charges BEFORE purchasing any items. Once these have been paid the parcel will still be delivered to you door. The cut off time for same day dispatch is 2pm Monday - Friday we do not dispatch any orders on Saturday or Sunday. We offer Bespoke Tuning Products, Custom ECU Mapping, Diagnostics, Servicing, Repairs as as well as a wide range of New & Used Genuine and OEM quality parts. One of our main aims is to provide products that give the best performance gains, whilst still maintaining the reliability and economy associated with a diesel engine. As we only own and work with TDIs, you can be assured that you are dealing with experts who have an in depth knowledge and understanding of all things VW Diesel. We are based in the UK and specialise in the import and export of parts all around the globe. Dont forget to'Like' our Facebook page too to be kept up to date with all the latest news and product information as it is announced. Get the all latest News, Updates and Special Offers about OUR STORE. We strive on providing the best possible experience while shopping with us. The item "Darkside Front Mount Intercooler Kit (FMIC) for 1.9 TDi PD130 ASZ" is in sale since Friday, July 13, 2018. This item is in the category "Vehicle Parts & Accessories\Car Parts\Turbos & Superchargers\Intercoolers & Parts". The seller is "darksidedevelopments" and is located in Barnsley.